If you already have one, please do not post answers to the forum. You may PM me and I will credit you in the thread. 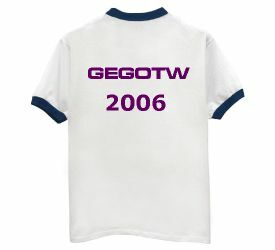 Also if you do not have a 2005 shirt, you may receive one (no more small). If you are the first to answer and already have 2005 and 2006 shirts, I'll send you a sweatshirt with the 2006 logo (design on front only). 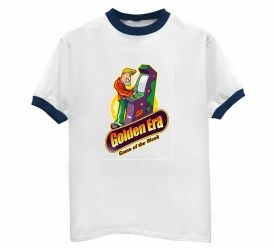 You know the character has some connection with Golden Era arcade games, or he wouldn't be here. By way of further hints, I think I'll do something a little different. I will answer any "yes or no" question that I can posted to the forum. Ever play 20 Questions? Last edited by The TJT on Tue Sep 05, 2006 10:01 am, edited 1 time in total. Looks Roman...Cesar? Not his traditional look but I've seen worse. Yeah, OK. Don't know what I was thinking. Bad idea. Hint #1: He is a video game expert. Hint #2: He is not a video game character. He was the protagonist in a three-part story drawn by Hilary Barta. Hillary Barta... H.B. ... Hanna Barbera came to my mind... just to report. Last edited by The TJT on Tue Sep 05, 2006 9:59 am, edited 1 time in total. Hint #3: The story appeared in January, April, and July of 1983. Hint #4: He has been transported to the planet Arn by the wizard, Azeron, who wants to overthrow Kant, a wizard who controls the planet with his army of computer-generated monsters. To win passage back to earth, he must steal the Sword of RAM, which would give Azeron access to Kant's computer, and source of power. Searching for "sword of RAM" did it, everything else, nothing. And there was no way I was trying "Kant", that would have been a headache. The_Pro wrote: Jim Rand !!!!! Yes, I was aware Googling "sword of ram" would hit it. That's why I made the last hint so long, with so many other names and such in it. PM me in case I've lost your size and address from last year.